Natural stone database, news, technical dictionary, online trade show, and much more – our portal offers everything that the natural stone industry needs. The centrepiece is a database with information and images of more than 4500 natural stones. 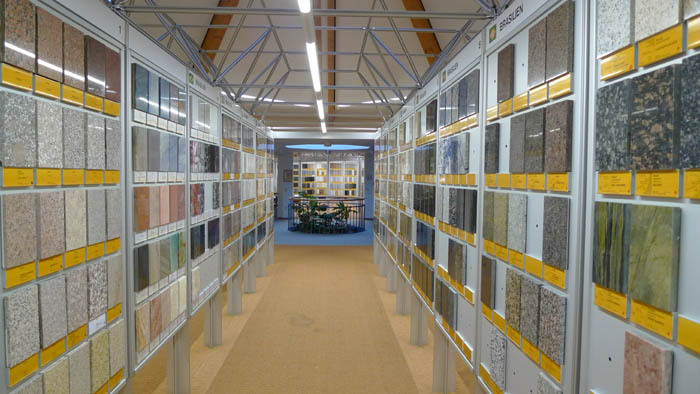 The "DNSA" database is based on the content of the German natural stone archive in Wunsiedel, which boasts the largest collection of natural stones in the world (>>>more information). The facility registers and archives every natural stone ever used for architecture or sculptures in German-speaking countries and all natural stones offered worldwide. New stones are added regularly to the online database. This keeps the database market-relevant and up to date. The DNSA database offers a unique range of technical information relevant to the industry. It includes information on colours, country of origin, trade names, areas of application and the petrographic description of the stones. In addition, Internet users will find details on availability, acid and frost resistance, physical properties such as the density and resistance to abrasion and pressure. Comprehensive search functions allow queries to be entered easily and specifically. For example, if you are looking for a frost and acid resistant polished grey granite from Sweden that is suitable for flooring, our database will provide you with the correct materials easily. The entries in the DNSA database are linked to information on merchants. If you wish to acquire a certain material, you can contact the merchant easily and without delay by e-mail, online form, telephone or fax. We offer merchants the opportunity to introduce themselves and provide contact information in the form of virtual business cards. This guarantees a fast and effective line to the customer –worldwide. Of course, Natural stone suppliers can also use traditional banners to advertise their companies and products (>>>more information). If you offer materials that are not yet in our database, we will be happy to register them (>>>more information).